After 146 years of high-flying stunts, clown shenanigans, and that thing where the elephant stands on a tiny platform, the owner of Ringling Bros. And Barnum & Bailey has announced that the company is permanently shutting down its traveling circus shows. 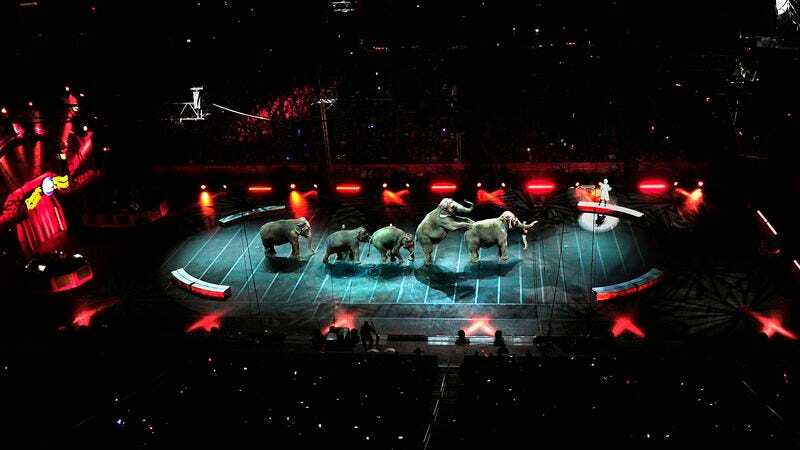 According to The Seattle Times, the production was “felled by a variety of factors,” including “declining attendance combined with high operating costs,” “changing public tastes,” and “prolonged battles with animal rights groups”—which drove Ringling Bros. to finally drop elephant acts early last year. The final performance of the former “Greatest Show On Earth” will be held on May 21 in Uniondale, New York’s Nassau County Coliseum. The circus’ popularity has been in a gradual decline for a long time, but as the Seattle Times post notes, “movies, television, video games, and the internet” have “captured young minds,” making kids “less and less enthralled” by what the circus has to offer. Kenneth Feld, the CEO of the company that owns Ringling Bros., explains that “the competitor in many ways is time,” because of the way the circus’ “quirks”—like traveling everywhere via train—have become wildly outdated. Interestingly, Ringling Bros.’ attendance also suffered a “dramatic drop” when it cut the elephant acts last year. Apparently, people don’t like seeing animals taken advantage of, but they also don’t like seeing circus shows without elephants. Go figure. There is one potentially exciting wrinkle to all of this, though: For the first time in 146 years, something new can step up and claim the title of “Greatest Show On Earth.” But what, if anything, can match the thrill of the Ringling Bros. Circus in its heyday? There may not be a “correct” answer, but it’s tough to beat that “Duck Army” video.